It sure was nice to visit Midway in July and see nearly all of my brothers. Our Uinta trip into Ruth Lake was fun as usual, however, with 14 people it was hard to keep track of everybody. The rock climbing was superb and we got into some fun fly fishing in the upper meadow beyond Jewel Lake. After all those events, Marty and I broke away and drove my truck over into Colorado. There we met up with a friend and spent the night in Steamboat, CO before driving on to Rocky Mountain National Park. It was our first visit to this area. We obtained a permit at the visitor center and then made our way to the Glacier Point trail head. We were greeted by fierce thunderstorms and rumors of a group of people struck by lightning 2 miles up the trail. Marty set a fast pace up the steep trail carrying a generous pack laden with climbing gear and 2 days of food. We were in typical alpine country with pine trees, rushing streams and scattered lakes and towering mountain peaks. The fresh smell of rain and pine forest was invigorating and a welcomed break from the high heat of the desert back home in St. George. Just a year prior I was high in the Cordellera Blanca mountain range of Peru. Now Marty and I were looking to climb one of the classic alpine climbs of North America. The Petit Grepon. This is a granite spire above the lake named, Sky Pond, in the heart of Rocky Mountain National Park. It required a 5 mile hike up a very good trail to the lake where, according to our permit, we could only bivy on rock or snow near the base of the climb. We arrived in a windy thunderstorm and huddled under a rock shivering while we pondered why we wanted to do the climb. Marty asked me several times during this trip "Is this fun"? 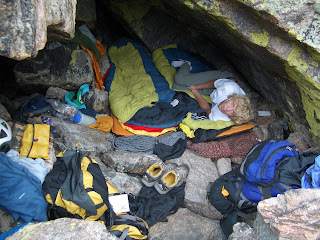 Soon we found a bivy cave where previous climbers had stacked rocks flat under two large boulders. There we made our home for the night. To our relief the storm soon abated and the evening sun came out and we had a calm beautiful night. The stars filled the sky and we noticed that we had the basin to ourselves that night. Morning came very early and we gathered our gear and left the cave and started scrambling up to the spire at 5:30 a.m. At 6 am we were roped up and climbing. 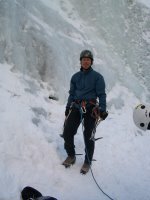 Marty led the first couple of pitches as it was relatively easy terrain. I then took over lead and proceeded to negotiate a couple of moderately easy pitches. The crux pitch came at number 5 and was an exciting pitch to lead I must say. As we neared the top the wall become more vertical and the feeling of exposure more intense. Soon Marty and I were rappelling down the rock face and enjoying the sunny day and satisfied with the experience of climbing such a fine route in a stunning setting. We had dodged any severe weather, stuck ropes or physical injury on this beautiful day in July. Our hike out was swift and we were soon on the road again back into Utah. We stayed another night in Midway before driving back down the state back into the desert and the summer heat.